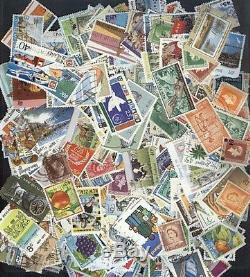 Collection of 1000 different New Zealand used stamps. A high percentage are large/commems. Includes an excellent selection of higher value/catalogue stamps. Generally fine condition, a few stamps may have faults. This is a very good price for this lot. Actual stamps supplied may differ slightly from that shown in the scan, which is a sample only. Code Wholesale 100: W001 (NOTE x 10). Powered by SixBit's eCommerce Solution. The item "NEW ZEALAND 1000 ALL DIFFERENT USED COLLECTION x10 WHOLESALE LOT (ID 100 W001)" is in sale since Sunday, April 27, 2014. This item is in the category "Stamps\Australia & Oceania\New Zealand". The seller is "kadinenz" and is located in New Plymouth.